Deva Prayag/ Pancha Prayag is one of the 108 Divya Desams of Lord Vishnu located at the confluence of river Alakananda and Bhagirathi in Tehri Garhwal, Uttarakhand. This is one of the oldest temples of Lord Vishnu consecrated by Sri Adi Sankara. The First Divyadesam as one travels from Haridwar to Badrinath is Devaprayag. This Kshetram is also called as "Thirukkandam" and also as "Kadi Nagar". 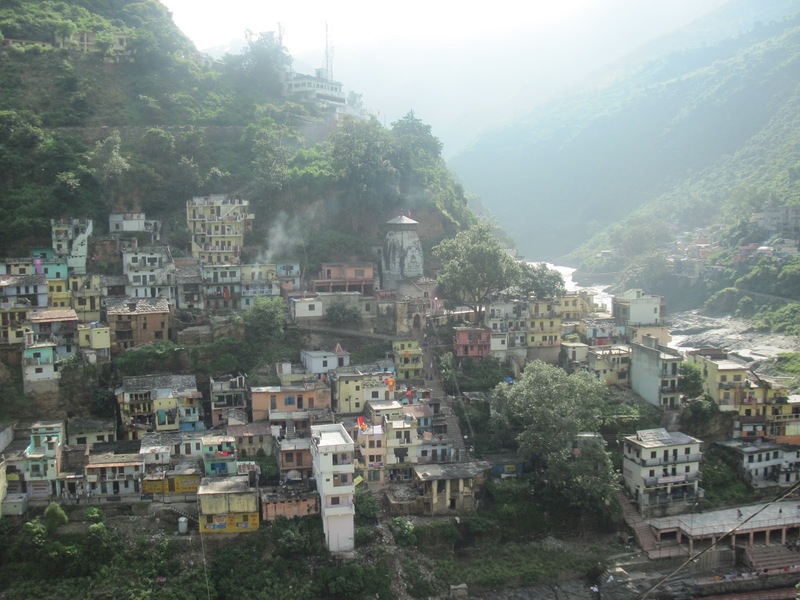 It lies about 45 miles away from Rishikesh to Badrinath and about 1700 feet above the sea level. Prayag means the place where two divine rivers mingle together. Devprayag meaning “Godly confluence”. The Bhagirathi and Alakananda meet to form the holy Ganges which comes down as Aadi Ganga. This place is also called as “Tirukkandam” and “KandvennumKadinagar”. Ancient name to this place is "SudarshanaKshetra". It is one of the five sacred confluences in the hills and is an important place of pilgrimage for devout Hindus and SriVaishnavites. The Alakananda arising at the Satopanth and Bhagirath Kharak glaciers near the border with Tibet and Bhagirathi at Gaumukh at the foot at the Gangotri glacier and Khatling glacier in the Garhwal Himalaya merge together at this place. Situated at the confluence of the Alaknanda and the Bhagirathi, the town of Devaprayag lies at an elevation of 830m (2723 feet). 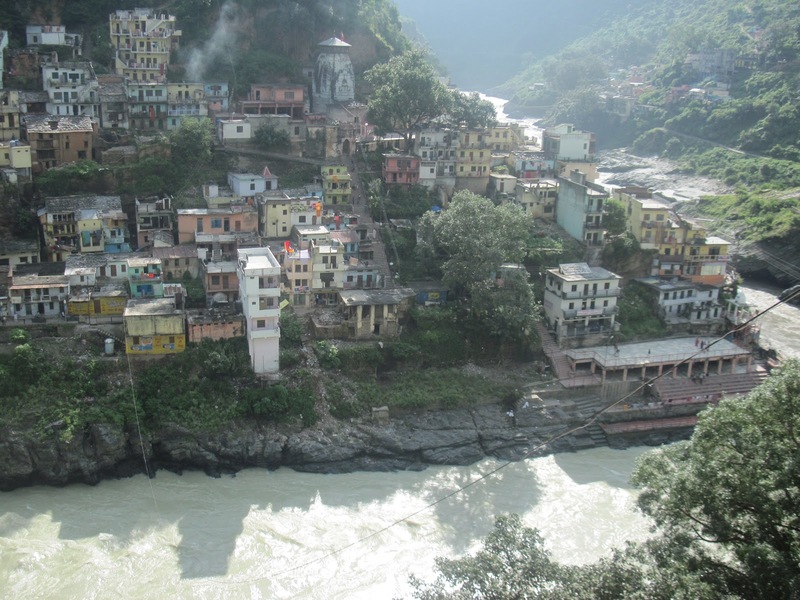 Traditionally, it is considered to be the place where sage Devasharma led his ascetic life in Satayuga, and succeeded in having a glimpse of God giving birth to its present name, Devprayag. Lord MahaVishnu gave vardaan to DevSharma that he would reside at this place forever. Lord Rama too had given pindadaanam to King Dasharatha at this place. Religious ablutions take place at 2 basins excavated in the rock at the junction of the holy streams - The confluence has Brahma Kund on Bhagirathi River and Vasishta Kund on Alaknanda River. Due to heavy monsoon rains the kund was completely submerged by Ganga water. Also, we could not see the the clear color distinction between the two rivers one generally observes. The river was flowing very fast. The Raghunath temple, with katyur architecture is enshrined with Lord Rama (also known as Purushothaman, Venimaadavar and NeelaMega perumal), whose height is 6 foot in Gaandhar style captures the attention of every visitor. The temple is built of huge stones. It stands upon a terrace in the upper part of the town and consists of an irregular pyramid capped by a white cupola with a golden ball and spire known as Mangala Vimaanam. The temple is surrounded by hills: Dasarathanchal in front, Narasimhachal to right and Giridhachal where the temple is located. It is believed both Lord SriRama and Dasharatha did penance at Devprayag. Rama and Lakshmana performed a yajna here to atone to kill Ravana, who was a Brahmin. It is one of the 108 Divya kshetrams for Srivaishnavas to visit. Dasharathachal Peak, contains of a rock, known as Dashrathshila, on which Raja Dasharath is said to have led a life of penance. A small stream, the Shanta running down from the Dasharathachal, is named after Shanta, the daughter of Raja Dasharath and is considered to be sacred. One will have to walk close to 10-15 minutes to reach the temple premises. We crossed over the bridge. Before climbing stairs to the temple, take a diversion towards the right to reach the bathing ghat. It is said that the Pandavas, after the Kurukshetra war, acquired the sin of slaughtering their own kin. To get rid of this, Rishi Markandeya said that it was sufficient for them to take a holy dip at Devaprayag and other prayags among the Pancha Prayag. Anna daanam at this place is highly auspicious. The Raja Swethakethu had done lot of dharmic anushtans, except anna daanam (even after annadanam having been emphasized by many maharshis). After having reached higher lokas, he started feeling terrible hunger. He requested Brahma to appease his hunger. Then Brahma suggested that he go back to the earth and undergo a specific remedy (upahaaram), which did not work. Next, a muni suggested that he bathe in the prayags. This too, did not work. Finally, he met Agastya muni at Devaprayag. Agastya muni suggested that he perform Annadanam at Devaprayag. When he said that he is unable to do it because he already has a Deva sharira, Agastya muni explained that it is enough for him to have something to give, which can be used to perform that Annadanam. When he had nothing Agastya muni told him to give the fruits of all his Punyas. When Swethaketu did this, Annadanam was performed on his behalf at Devaprayag, following which his hunger was satiated and he obtained Moksham. It is said that Devaprayag is a spot where intense meditation for one Ghatika (i.e, 24 minutes) suffices to remove all sins and achieve one's objectives and even moksham. The two other Ghatikaachalams being Sholingur (Thirughatikai) and Thirukkadiththaanam (in Kerala). The Banyan tree here is of very high importance. The Banyan tree is a holy tree worshipped by Hindus. It is said all Brahma, Vishnu (as Venimadhava) and Maheshwara (as Aadalangeshar) reside in this tree and hence it is considered very auspicious. The pradakshina of this tree during sunrise is of high spiritual importance. The Lord Raghunatha is adorned with the following color of vastram on each specific day: White (Monday and Friday), Red (Tuesday and Sunday), Green (Wednesday) and Black on Saturday. Perialwar says in his pasuram that the smoke from the Yagnas' agni kunds, used to spread on both the shores of the river Ganga here. There is a witness to Lord Raghunatha here. Sri Rama after killing Ravana, came here and meditated to wash off the sin arising out of killing Ravana. As we proceed to the temple after a bath in the river, we can notice the Footprints of Sri Rama on a huge rock. We now get into the temple, whose staircase is quite steep and high. In the temple we see Sri Purushottama. We can also see the rock seat on which Sri Rama meditated. It has a backrest also. We also see a big Vata vruksham [banyan tree]. This tree is existing for many thousands of years. Lord here is in Chaturbhujam (4 hands), Nindra tirukkolam (standing posture) and is facing his Thirumugam (face) towards the east direction. A bow and arrow of Sri Rama is kept near the vigraham. Prathyaksha darshanam was given to Bharadwaja Maharshi and Brahma. The Thayaar found in this kshetram is Pundareekavalli (Sri Vimala --- Seetha thayaar). The garbhagriham also has vigraham of Badri Narayan. The utsava murthi is Sri Rama accompanied by Sita, Lakshmana and Hanuman. 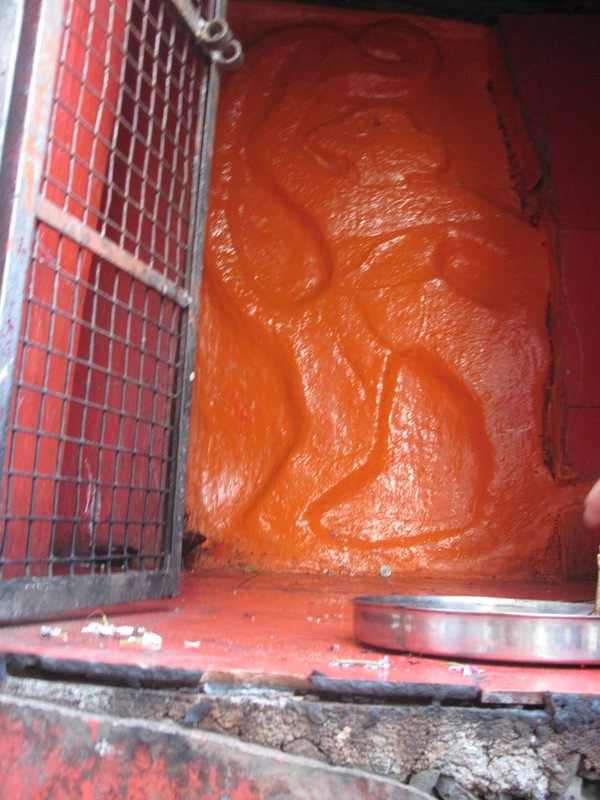 The utsava murthis are kept in Ram Gaddi during important festival days. 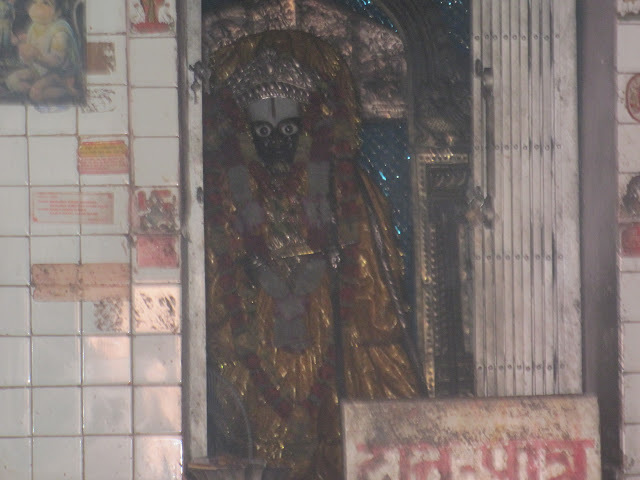 Sri Adi Shankaracharya installed the idol of Raghunath. This temple remains open from 6.00AM to 12.00PM in the morning and 5.00PM to 9.00PM in the evenings. The visiting hours may change during the time of winter.